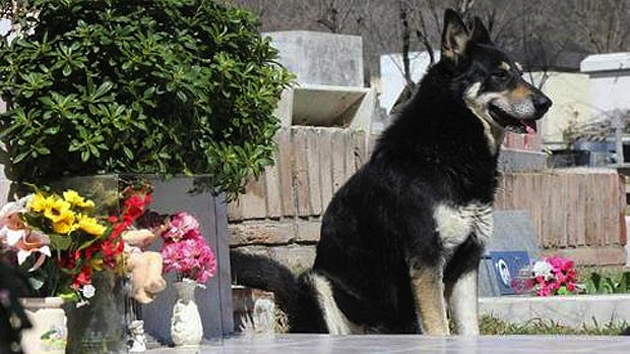 An extremely dedicated dog has continued to show its loyalty, keeping watch on its owner's grave six years after he passed away. Miguel Guzman adopted Capitan in 2005 as a gift for his teenage son, Damian. And for the past six years, Capitan has continued to stand guard at Miguel's grave. The family says the dog rarely leaves the site. "We searched for him, but he had vanished," widow Veronica Guzman told LaVoz.com. "We thought he must have got run over and died. 'The following Sunday we went to the cemetery, and Damian recognized his pet. Capitan came up to us, barking and wailing as if he were crying." "It is a mystery how he managed to find the place," she said. "He turned up here one day, all on his own, and started wandering all around the cemetery until he eventually found the tomb of his master," Baccega said. "During the day he sometimes has a walk around the cemetery, but always rushes back to the grave. And every day, at six o'clock sharp, he lies down on top of the grave, stays there all night." But the Guzman family hasn't abandoned Capitan. Damian says the family has tried to bring Capitan home several times but that he always returns to the cemetery on his own. "I think he's going to be there until he dies, too. He's looking after my dad," he said.